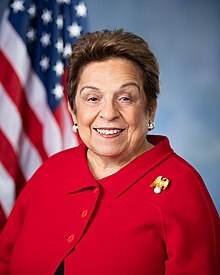 Donna Edna Shalala (/ʃəˈleɪlə/ shə-LAY-lə; born February 14, 1941) is an American politician who is currently the U.S. Representative for Florida's 27th congressional district, which includes just over half of Miami as well as many of its eastern suburbs. She previously served as the United States Secretary of Health and Human Services under President Bill Clinton from 1993 to 2001. She was the president of the University of Miami, a private university in Coral Gables, Florida, from 2001 through 2015. Previously she was the chancellor of the University of Wisconsin–Madison from 1988 to 1993. Shalala served as Trustee Professor of Political Science and Health Policy at the University of Miami, and was President of the Clinton Foundation from 2015 to March 2017. Shalala was elected to the U.S. House of Representatives in November 2018. Shalala was born in Cleveland, Ohio of Maronite Catholic Lebanese descent, the daughter of Edna Smith and James Abraham Shalala. Shalala's father sold real estate and her mother, one of the first Lebanese-Americans to graduate from Ohio State University, was a teacher who worked two jobs and attended law school at night to become a lawyer at 41; she practiced for fifty years, retiring at age 91. Donna Shalala has a twin sister, Diane Fritel. The sisters played youth baseball where (future New York Yankees owner) George Steinbrenner coached their team. Shalala attended West Technical High School where she was the editor of the school newspaper. She went on to receive a bachelor's degree in 1962 from Western College for Women. [a] From 1962 to 1964, she was among the first volunteers to serve in the Peace Corps. Her placement took her to Iran where she worked with other volunteers to construct an agricultural college. In 1970, she earned a Ph.D. from the Maxwell School of Citizenship and Public Affairs at Syracuse University in Syracuse, New York. Shalala began her teaching career as a political science professor at Baruch College (part of the City University of New York), where she also was a member of the American Federation of Teachers union. In 1972, Shalala became a professor of politics and education at Teachers College, Columbia University, a post she held until 1979. In 1975, Shalala became the only woman on the Municipal Assistance Corporation, a group tasked with saving New York City from a financial crisis. She gained notoriety as the only woman on the Corporation. Concurrently, from 1977 to 1980, she served as the assistant secretary for policy development and research at the U.S. Department of Housing and Urban Development during the Carter Administration. Shalala's first experience with academic administration came on October 8, 1980, when she became the tenth president of Hunter College, serving in this capacity until 1988. Shalala next served as chancellor of the University of Wisconsin–Madison (1988–1993). At the time of her chancellorship, the university included 42,000 students, employed 16,500 people, and had an annual budget of $1 billion. She was the first woman to lead a Big Ten Conference school, and only the second woman in the country to head a major research university. Under Shalala's chancellorship and with her support, the university adopted a broad speech code subjecting students to disciplinary action for communications that were perceived as hate speech. That speech code was later found unconstitutional by a federal judge. Also while chancellor, Shalala supported passage of a revised faculty speech code broadly restricting "harmful" speech in both "noninstructional" and "instructional" settings. The faculty speech code was abolished ten years later, after a number of professors were investigated for alleged or suspected violations. As Madison chancellor, Shalala, with then athletic director Pat Richter, interviewed and hired football coach Barry Alvarez who went on to become Wisconsin's all-time leader in football wins, with numerous appearances by Wisconsin at the Rose Bowl. Shalala during her tenure as the Secretary of Health and Human Services. Following a year serving as chair of the Children's Defense Fund (1992–1993), Shalala was nominated in 1992 by President-elect Bill Clinton for the position of United States Secretary of Health and Human Services. The Washington Post labeled her "one of the most controversial Clinton Cabinet nominees". Her nomination went before the Senate Finance Committee in January 1993. At the start of her tenure, the Department of Health and Human Services employed 125,000 people and had a budget of $539 billion. Shalala served in this role for all eight years of his administration, becoming the nation's longest serving HHS secretary. In 1996, Shalala was the designated survivor during Clinton's State of the Union address. She was also known for her fervent anti-drug stance. She was the first Lebanese-American to serve in a Cabinet position. After the end of the Clinton administration in 2001, Shalala became president of the University of Miami (UM). She created a UM fundraising campaign called "Momentum," designed to raise UM's endowment from approximately $750 million to $1 billion; the goal was later increased to $1.25 billion by the end of 2007. In February 2012, the University of Miami announced Momentum2: The Breakthrough Campaign for the University of Miami, with $906 million already raised at the time of the public launch. On October 26, 2012, UM announced that Momentum2 hit the $1 billion mark, on track to reach the fundraising goal of $1.6 billion in 2016. Drawing on her experience after serving as Secretary of Health and Human Services, Shalala taught a course covering the United States healthcare system every spring semester. On January 20, 2012, the Chronicle of Higher Education reported that Shalala had been paid almost a half a million dollars in 2010 to serve on the boards of three companies, two of which were run by UM trustees. Shalala faced some criticism for her response to a nationally publicized custodial workers' strike at the University of Miami, which lasted from February 28, 2006, until May 1, 2006. Critics called UM's custodial workers among the lowest paid university-based custodians in the nation and alleged they were not earning a living wage. The strike prompted Shalala to raise wages. Shalala was also criticized for living in luxury while the custodians did not have health insurance. Shalala criticized union organizer's tactics, including a sit-in that she said prevented students from attending classes. In the fall of 2007, Shalala was inducted into UM's Iron Arrow Honor Society. On September 8, 2014, Shalala announced that she would be stepping down at the end of the 2014-2015 academic year. In 2015, Shalala took a leave of absence from her tenured professorship at UM to volunteer for the Clinton Foundation. She followed her tenure as president of the University of Miami with being named chief executive officer of the Foundation. According to The New York Times, Chelsea Clinton helped persuade Shalala to leave the Miami position, move to New York and head the foundation. Shalala maintained a home in Miami and taught part-time at UM while heading the foundation in New York. Shalala led the Clinton Foundation during the 2016 presidential election, in which Hillary Clinton was a leading candidate and the propriety of the foundation's activity came under scrutiny. In a September 14, 2016, interview on MSNBC, Shalala admitted that there was “no question” that donors to the Clinton Foundation had been given “courtesy appointments” in the State Department while Hillary Clinton ran that department. Shalala oversaw the termination of the Clinton Global Initiative during her tenure as CEO, as well as other reductions in operations intended to avoid conflicts of interest if Clinton won the election. She resisted calls by the Washington Post and USA Today to shut down the foundation entirely, arguing that "there are human beings around the world who would be affected by these decisions." Shalala left the Clinton Foundation in April 2017 to return to her full-time teaching position at UM; she was replaced by her former HHS deputy Kevin Thurm. Following a September 2015 Clinton Global Initiative event held at the Sheraton New York, Shalala fell ill. It was subsequently reported by a foundation statement that she had suffered a stroke. As of early 2018, she claimed to have "totally recovered." In March 2018, Shalala declared her candidacy in the Democratic primary for Florida's 27th congressional district. The district voted overwhelmingly for Clinton in the 2016 presidential election, but its House seat was held by 30-year incumbent Republican Ileana Ros-Lehtinen. In an interview with CBS Miami, Shalala stated that she supported universal healthcare coverage, but opposed a Medicare For All single-payer healthcare system because she believed that individuals who liked their current employment-based healthcare plans should be able to keep them. On August 28, 2018, Shalala won the Democratic primary. Shalala ran against Republican candidate Maria Elvira Salazar, a popular anchorwoman for Miami Telemundo outlet WSCV, in the general election. Shalala's campaign emphasized her experience and sought to tie Salazar to President Donald Trump, who was unpopular in the district. The race proved closer than expected, in part because Shalala does not speak Spanish; the 27th district is over 63 percent Latino. As late as a month before the election, polls showed Shalala either behind or practically tied with Salazar. However, Shalala won the election at the age of 77, making her the second-oldest freshman Representative in history (after James B. Bowler, who was elected at the age of 78 in 1953) and the oldest female freshman Representative in history. Shalala was sworn in as a member of the 116th Congress on January 3, 2019. She is the oldest freshman member of the 116th United States Congress. Shalala is currently serving on the Board of Directors of the United States Soccer Federation. Shalala served as a member of the board of directors of Lennar Corporation from 2001-2012. She served on the board of directors of Gannett Company from 2001 to 2011, retiring because of age limits. The Chronicle of Higher Education has reported on the conflict of interest of Shalala sitting on boards of property development companies. On March 6, 2007, President George W. Bush named Shalala and Bob Dole to head a presidential commission called the President's Commission On Care for America's Returning Wounded Warriors. The commission was formed in response to a growing outcry over the care of wounded outpatient soldiers. The commission included seven other members, ranging from injured war veterans to the wife of a wounded staff sergeant who suffered burns across 70 percent of his body. Demands for corrective action arose after The Washington Post exposed living conditions in a decrepit Army-owned building just outside Walter Reed Hospital and highlighted obstacles and delays in the treatment of soldiers who suffered serious injuries in Iraq and Afghanistan. The commission subsequently issued several recommendations for improvement of these facilities. In 1985, Shalala became a founding member of EMILY's List, a political action committee that seeks to elect pro-choice Democratic women to office. Shalala served from 2001-2007 on the board of the Albert Shanker Institute, a small, three-member staff organization named for the former head of the American Federation of Teachers. She is an honorary board member of the American Iranian Council, an organization that seeks to promote closer U.S. relations with Iran. She served on the board of directors for Gannett Company. Shalala serves as a co-leader of the Nutrition and Physical Activity Initiative at the Bipartisan Policy Center. She serves as a distinguished senior fellow in the Economic Studies Program and the Engelberg Center for Health Care Reform at the Brookings Institution. She is also a member of Washington D.C based think tank, The Inter-American Dialogue. HHS Secretary Kathleen Sebelius greets Shalala, former Senate Majority Leader Bill Frist, and former HHS Secretary Louis Sullivan prior to a bipartisan health reform implementation meeting in Washington, D.C., in 2010. Shalala also served as a panelist on the Blue Ribbon Study Panel on Biodefense, a working group of former high-ranking government officials and academic experts that put together a set of recommendations regarding the United States' defense capabilities against biological threats. On June 19, 2008, Shalala was awarded the Presidential Medal of Freedom by President George W. Bush. In 2010 she received the Nelson Mandela Award for Health and Human Rights. She was inducted into the National Women's Hall of Fame in Seneca Falls, New York in 2011. In 2014, she was recognized by the Harry S Truman Library and Museum with the Harry S Truman Legacy of Leadership Award. Shalala has been awarded more than 50 honorary degrees. Shalala has been elected to the Council on Foreign Relations; National Academy of Education; the National Academy of Public Administration; the American Academy of Arts and Sciences; the American Philosophical Society; the National Academy of Social Insurance; the American Academy of Political and Social Science; and the Institute of Medicine of the National Academy of Sciences. ^ In 1976, Western College for Women merged with Miami University in Oxford, Ohio. ^ 97th United States Congress (April 2, 1981). "PN152 - Nomination of Emanuel S. Savas for Department of Housing and Urban Development". Congress.gov. Archived from the original on November 27, 2018. Retrieved April 14, 2019. ^ Boston, 677 Huntington Avenue; Ma 02115 +1495‑1000 (October 20, 2017). "Donna Shalala, former President of the Clinton Foundation". Voices in Leadership. ^ Amy Chozick (March 6, 2015). "Donna Shalala to Lead Clinton Foundation". The New York Times. Retrieved March 7, 2015. ^ a b c Clark, Lesley (2018-11-06). "Shalala rode anti-Trump sentiment to take a congressional seat away from the GOP". Miami Herald. Retrieved 2018-11-07. ^ Frank Northen Magill (1995). Great lives from history: American women series Volume 5. Salem Press. ^ a b c d e f g Chira, Susan (December 12, 1992). "THE TRANSITION: Woman in the News; Emphasis On Action: Donna Edna Shalala". The New York Times. Retrieved August 17, 2018. ^ a b Cohen, Howard (December 2, 2014). "Lawyer Edna Shalala, mother of University of Miami president, dies at 103". Miami Herald. Retrieved 2018-10-07. ^ a b c Vobejda, Barbara (January 14, 1993). "Shalala: A Lifetime Spent in the Center of Storms". The Washington Post. Retrieved August 17, 2018. ^ Lucas, Mike (July 16, 2018). "2018 UW Athletic Hall of Fame: Donna Shalala". University of Wisconsin. Retrieved August 19, 2018. ^ "Mergers in Higher Education" (PDF). Retrieved August 3, 2018. ^ "At Helm of Nation's Health Donna Shalala Thrives". Harvard Crimson. Retrieved June 17, 2016. ^ a b "PeaceCorpsOnline web site". Peace Corps. Retrieved September 23, 2011. ^ Vobejda, Barbara (April 15, 1993). "On a Health Kick". The Washington Post. Retrieved August 19, 2018. ^ Curriculum Vitae Donna E. Shalala. Archived September 19, 2014, at the Wayback Machine University of Miami. Retrieved October 19, 2014. ^ "Silhouettes of TC Today cover". Teachers College - Columbia University. Retrieved May 11, 2016. ^ "Clinton Foundation President Donna Shalala to Address Graduates at Drexel's Commencement". DrexelNow. Retrieved May 11, 2016. ^ "Secretary Donna Shalala Speaks at the CATS Roundtable Radio Show". John Catsimatidis Official Site. February 24, 2016. Retrieved May 11, 2016. ^ "Past presidents and chancellors". Office of the Chancellor, University of Wisconsin. Retrieved May 11, 2016. ^ "Donna Shalala". Retrieved September 30, 2015. ^ a b "Donna Shalala biography". The Washington Post. December 15, 1999. Retrieved September 23, 2011. ^ Alan Charles Kors from the July 1999 issue (March 1, 1999). ""Cracking the Speech Code," ''Reason'', July 1999". Reason. Retrieved September 23, 2011. ^ Ed Sherman from the. "She Left Wisconsin With a Rosy Outlook,". Retrieved September 30, 2015. ^ "Politicos Gather for State of the Union, but 'Designated Survivor' Will Be in Hiding". ABC News. January 27, 2014. Retrieved June 17, 2016. ^ "UM president Donna Shalala lauded for handling of NCAA investigation". Miami Herald. Retrieved June 17, 2016. ^ "Donna Shalala". University of Miami. Retrieved 2018-11-07. ^ a b Goodnough, Abby; Steven Greenhouse (April 18, 2006). "Anger Rises on Both Sides of Strike at U. of Miami". The New York Times. p. A.18. ^ Chang, Daniel, Michael Vasquez and David Smiley, "University of Miami President Shalala announces she will retire in 2015", Miami Herald via Sun Sentinel, September 08, 2014. Retrieved 2018-12.30. ^ a b c d e Charles, Jacqueline (2017-04-25). "Former Clinton Foundation head Donna Shalala is back in Miami and at UM". Miami Herald. Retrieved 2018-11-07. ^ Nicholas, Peter; Reinhard, Beth. "Donna Shalala to Lead Clinton Foundation". The Wall Street Journal. Retrieved April 14, 2016. ^ a b Haberman, Maggie; Chozick, Amy (September 29, 2015). "Donna Shalala, President of Clinton Foundation, Has Stroke". The New York Times. Retrieved September 30, 2015. ^ Bradner, Eric (2016-09-15). "Clinton Foundation president rebuts Trump's 'pay-for-play' accusations". CNN. Retrieved 2018-11-07. ^ Heavey, Susan (2016-08-24). "Chorus grows for Clintons to shutter charitable foundation". Reuters. Retrieved 2018-11-07. ^ "Former UM president Donna Shalala suffers stroke". Miami Herald. Retrieved April 14, 2016. ^ a b Gomez Licon, Adriana (2018-03-08). "Donna Shalala seeks to fight Trump if elected to Congress". AP News. Retrieved 2018-11-07. ^ Scherer, Michael (March 6, 2018). "Former Cabinet secretary Donna Shalala to run for Congress in Miami". The Washington Post. Retrieved April 26, 2018. ^ Daugherty, Alex; Smiley, David (March 5, 2018). "Donna Shalala is running for Congress in bid to replace Ros-Lehtinen". Miami Herald. Retrieved April 26, 2018. ^ "Web Video Extra: Full Interview With Congressional Candidate Donna Shalala". CBS Miami. March 8, 2018. Retrieved August 17, 2018. ^ Morejon, Andrea Torres, Liane (August 28, 2018). "Shalala wins Democratic primary for U.S. House Florida..." WPLG. Retrieved November 7, 2018. ^ Lesley Clark (October 7, 2018). "Everybody knows her name, but Donna Shalala is finding it difficult to get to Congress". McClatchy Washington Bureau. ^ "Board of Directors". www.ussoccer.com. ^ a b c d "Error 404: Page Not Found". ucomm.miami.edu. ^ "Donna Shalala, Independent Director". Morningstar. Retrieved March 13, 2011. ^ Clabaugh, Jeff (February 23, 2011). "Donna Shalala leaves Gannett board". Business Journal. Retrieved March 13, 2011. ^ "PeaceCorpsOnline". Peace Corps. Retrieved September 23, 2011. ^ Vaida, Bara; Skalka, Jennifer (June 28, 2008). "Can EMILY's List Get Its Mojo Back?". National Journal. Archived from the original on February 5, 2015. Retrieved February 5, 2015. ^ "American Iranian Council web site". American-iranian.org. Retrieved September 23, 2011. ^ McDuffee, Allen (April 2, 2012). "Donna Shalala, former HHS secretary, joins Brookings". The Washington Post. ^ "Donna Shalala". Inter-American Dialogue. Retrieved April 13, 2017. ^ "Secretary Donna Shalala". biodefensestudy.org. Retrieved February 13, 2017. ^ "U.S. Senate: Presidential Medal of Freedom Recipients". www.senate.gov. President Donna E. Shalala Biography, University of Miami. "America's Best Leaders: Q&A with Donna Shalala, President of the University of Miami, U.S. News & World Report, October 22, 2005.